Don’t reinvent the wheel for every product launch plan. Keep goals and responsibilities clear, manage timelines, and more with our template. Clear goals, messaging, and processes are essential for successful product launch plans. Yet many teams start from scratch or lose track along the way. Our launch template gives you tried and true steps that keep launch details clear and cross-functional teams connected. Paired with the power of Asana, you’ll lead a winning launch. Share goals and messaging. Teams can work off of the same information, easily share docs, and find all their work again when it’s in Asana. Keep communication clear across teams. From big status updates, to questions about nitty gritty launch details, Asana is the place for communicating about launch work. No more long email threads. Learn our top five steps for creating a foolproof launch process. See an in-depth demo of how Stance manages their fastest launches yet with Asana. Templates are just one secret to faster launches. What else helps InVision go to market faster? Our product marketing course can show you the best way to keep launch tactics clear and manage timelines. Read how AdRoll plans their go-to-market, positioning, pricing, and more with Asana. 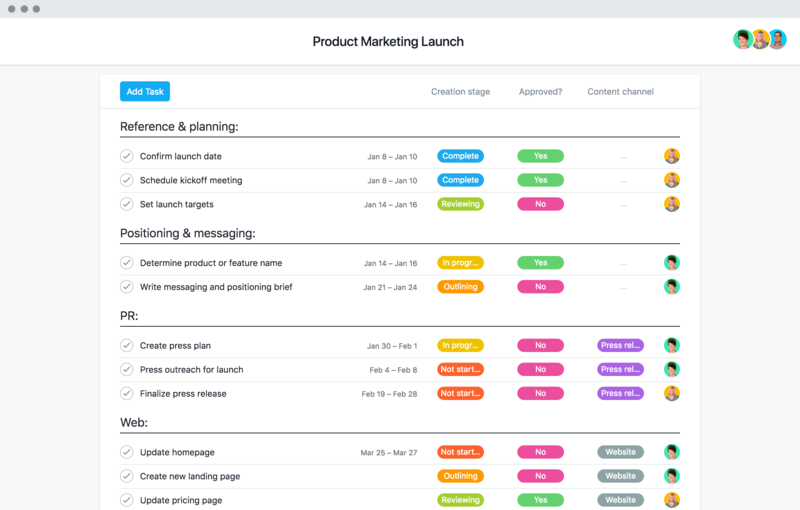 Product marketing teams worldwide trust Asana Premium to plan their biggest and best launches yet. Get started with a free trial today.